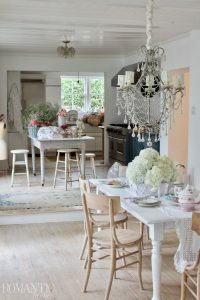 Step inside Rachel Ashwell's pretty and practical home. Rachel Ashwell’s living room is every bit as comfortable as it is cozy. A colorful mix of paintings adds personality to the rough-hewn mantel. Few homes in southern California have the architectural character or timeless appeal of older homes. If a classic style of home is at the top or your list of must-haves, you often have to search high and low for the right house. In an old home where built-in storage options are few, a stand-alone closet offers valuable space and fits right in with Rachel’s time-honored aesthetic. 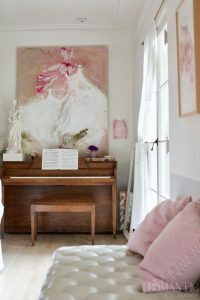 The painting above the piano is by artist Laurence Amelie. In the foreground, a Hollywood Regency style tufted bench offers extra seating. 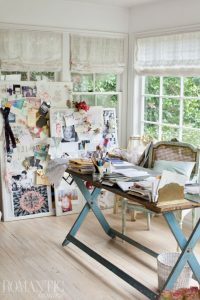 But when Rachel Ashwell, designer and founder of Shabby Chic, stumbled across this Brentwood house eight years ago, she fell in love with its quirks and knew it would be just the place to call home. The kitchen and dining area flow from one space to the other for an open layout that is perfect for casual, convivial entertaining. While the home already had many exceptional details, including arched walkways, beautiful balconies, and original doors and hardware, Rachel decided to restore some of the key design aspects to a more classic style. “As often is the case, the baths and kitchen had been renovated, but in a slick and polished style, so I restored them and put them back to what I consider would have been the authentic style for the house,” Rachel says. 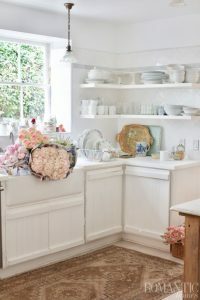 White floating shelves against white tile, along with the farmhouse sink and painted cabinets, create a cozy kitchen space. 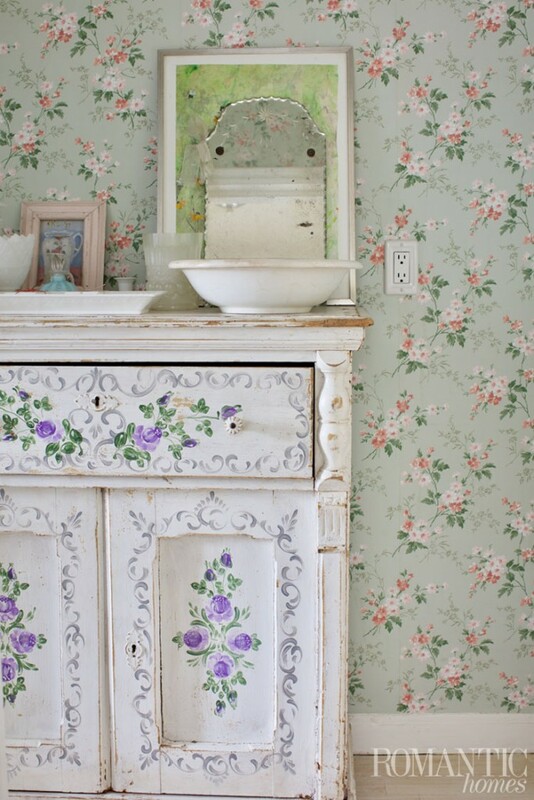 One of Rachel’s favorite feminine touches, floral wallpaper, adds whimsy to this antique hutch. She stores her collection of mismatched dishes inside. When Rachel moved in, walls separated the kitchen from the main living room; she opened everything up so it’s all one large space. “It feels like New York loft living, and I have a lot of guests stay here, so I wanted it to have a feeling of a lot of space and not lonely with all these closed-off rooms,” Rachel says. Now with multiple seating areas and dining and workshop areas, it’s an ideal multipurpose room for everyday use. Bedding in Rachel’s signature florals adds a playful pattern to her master bedroom. 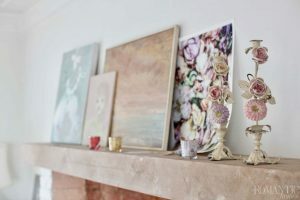 A big part of the home’s charm—and what Rachel is very well known for—are the many floral designs in fabric prints and small-scale use of wallpaper patterns you’ll find throughout the home. 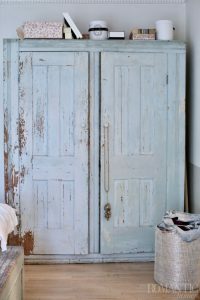 They add a soft and sophisticated touch in her signature Shabby Chic style. Wallpaper in a lacy blue print adds a touch of elegance to the master bathroom. Rachel layers this bathroom space with mix-and-match floral patterns. 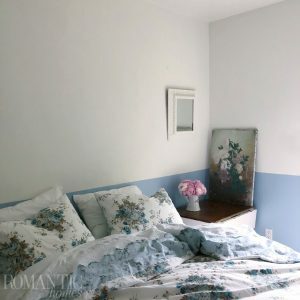 The blue and white two-tone walls perfectly coordinate with Rachel’s Simply Shabby Chic bedding. 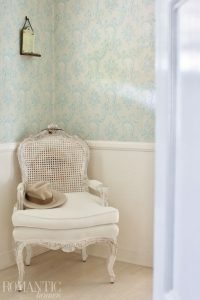 Another design trick for bringing in soft color: Rachel paints the walls white, but from the floor to about 3 feet off the ground, she paints it over with a light gray, pink or blue for a two-tone look. “It [adds] color in an unassuming, subtle way,” she says. “They did that a lot in Morocco, and that’s where I got the idea.” These small but impactful design details give Rachel’s home its personality. 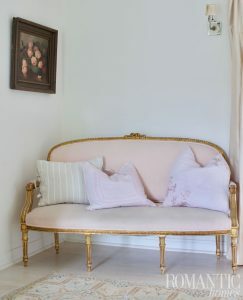 An antique settee with gold trim and blush pink upholstery is an elegant touch. Antiques add patina and character, and Rachel looks to flea-market pieces to create the look of timeworn elegance she loves. “Nearly all the cabinets, tables and chairs are flea market-found and refurbished to the point that they’re functional and clean, but I try to hold on to the authentic patinas and textures,” Rachel says. Rachel’s office is in a nook off the dining area. Though small, the floor-to-ceiling windows ensure an open atmosphere. She also mixes in a few reproduction furniture pieces from the Rachel Ashwell Furniture collection to achieve the style, scale and function she wants. Many of her antique pieces are recovered in machine-washable fabric for durability since they’re white. 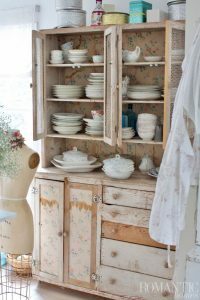 Her collections of antique dishes, trays, vases and containers decorate hutches, tabletops and shelves for a cozy, charming look. All the bedding, in fabric patterns or soft hues, is romantic and vintage inspired. The wood mantel is raw and unstained, a natural complement to the painted bricks below. Rachel as styled it with an assortment of her favorite small paintings. Want to emulate Rachel’s signature style? Learn how with her tips. Soft color: “My palette tends to be on the softer side,” Rachel says. From various pinks and raspberries to teal, the look is fresh and inviting. Glamour: “I always like a little bit of glamour.” These bits of bling can be crystal chandeliers or a rug with silver threading through it. Timeworn: “Embracing the beauty of imperfections and faded grandeur is a big thing for me. I don’t get too neurotic if something gets chipped. Read Courtney Allison’s behind-the-scenes look at this photo shoot!